Merry Christmas everyone! We are able to all be together as a family here. It’s the first Christmas in three years that we have managed to be together. Maybe there is something to being apart that makes being together so special. I got here to my folks’ home yesterday. I stayed for a few hours. During that time we had a chat with one of my aunts back in Poland. The little one was taking a nap so he wasn’t seen by them. It’s nice to have that visual connection through our modern means. Those bonds that I have fostered remain. Soon after our chat I was whisked away for a meditative experience. When I came back almost everyone was asleep except for my brother. We stayed up for a while watching some cooking show and absorbing some techniques to use later. On Christmas Eve in the morning I again was whisked away by my dad to run a few errands. First we dropped off the boys for their day program and then we’re off to a friend of theirs for an exchange in consumable gifts. The couple is in their eighties and my parents have regular contact with theirs. Going even so far as going to some medical appointments with them. They invited us in for a coffee and we sat down for a short chat. The topic quickly moved from the regular Christmas chat to more charged topics. The old man related stories from the news and then moved on to more historical news stories and how they related to race relations in the states. He used to live there and he recalled the fears during the riots in LA. I find my ideas regarding the causes of these issues to differ from his. We left before the ideas could get more divisive. It was a pleasant visit. I can see why my parents have affinity for this couple. There were more things to take care of. My parents want to downsize and because of this they want to have furniture that better houses their things. We got to one of those big box shopping centers that sells furniture to check out a bedroom set that would be both functional and space saving. I have my own thoughts about these purchases but who am I to object to their desires. The rain has been falling heavily and in some spots it was cold enough to land as snow. Those areas looked magical as we drove around. We visited their future abode and came back. My dad wanted to give a little present to one of his neighbors. We also wanted to check up on the place. It was nice to joke around with him a little bit. He enjoys his time to get away from things at the house and attend all of his little appointments that help fill his time. The preparations at home were in full swing. We all pitched in to help out. Mom couldn’t do all of it herself. Besides its time that we started to take things over a little bit. It was important to have my parents spend time with us together a little bit instead of us being separated in our individual groups. I pondered some of this during my potato peeling session. These were potatoes that came from my parent’s garden. There are just a few potatoes remaining in the box and since they sat there for a while and since they are not some heirloom potatoes they required some cleaning. Many of the dishes were prepared but just needed some cooking. Since I still had to cook the potatoes I took over the cooking duties as well. My dad made some salmon patties and there was some other kind of fish that needed to be breaded and fried. It felt good to cook. The commotion around the kitchen was constant. The little one kept crawling through and one could always echo locate him through the “broom broom” sounds that has become his favorite sound. If we were birds this would be our chirping sound. It’s tradition that Christmas Eve dinner begins at the sight of the first night star. That happens to be a bit after sundown. There are traditionally twelve courses of all different varieties that are supposed to represent the twelve apostles or whatever else twelve represents in our collective culture. We weren’t going to be starting anything on time today. There are always the last minute things and we were all so hungry. It’s tradition to fast during the day as well. Personally I was jacked up on some coffee as a few nibbles of cake and then some fish that I was frying up. My brother hovered close as did all the others coming in to inspect and taste a bit of it to make sure it’s cooked right. The rest of the dishes were warmed ready to be served. Everything came together eventually for the dinner. We said a small prayer before our meal and sat down to eat. Normally as tradition calls we all usually break bread with each other wishing each other blessings for the year. Since it was getting late and the boys were getting hungry we postponed this until later. Part of the tradition is that no one gets up from the table and that we have an extra setting in case someone comes to the door asking for a meal. It’s one of those traditions that harkens back to the biblical story where no one would take the family in and they ended up in a stable. My mom related a story of one of her friends in Mission who had four unexpected guests. The man and his children showed up at her place. The man was recently abandoned by his wife and they wanted to spend Christmas with others and not alone. Coming together and being together is the true meaning of Christmas. It is a family celebration. We ate and talked joking around maybe a bit too much. When we are all together sometimes that is what happens. The food was delicious as always. 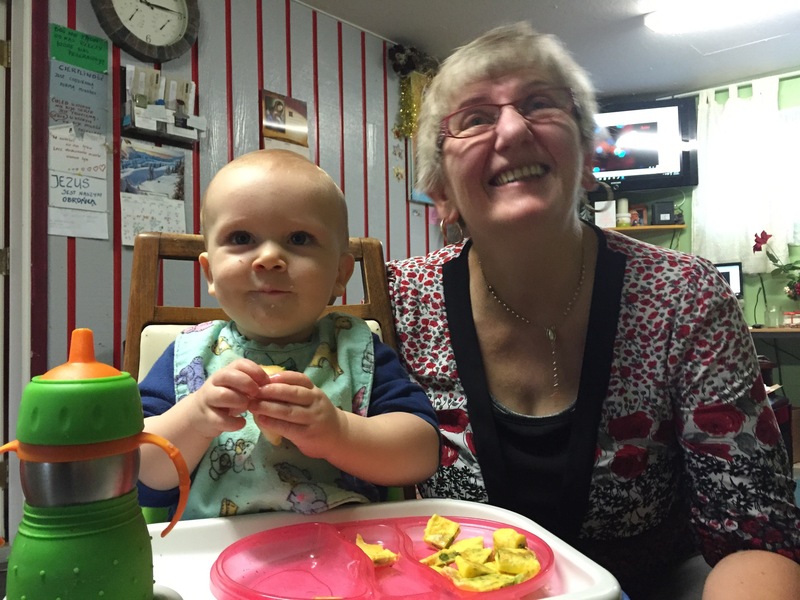 The traditional meals have somewhat become westernized over the time that we have spent here. Instead of carp we have salmon and there was no straw under the linen on the table. The main message of being together didn’t change though. It has been a long time since we have all been together. We made two seperate trips to church. My sis brother et all went to the early mass close to the house while I accompanied my parents to the polish mass out in Surrey. 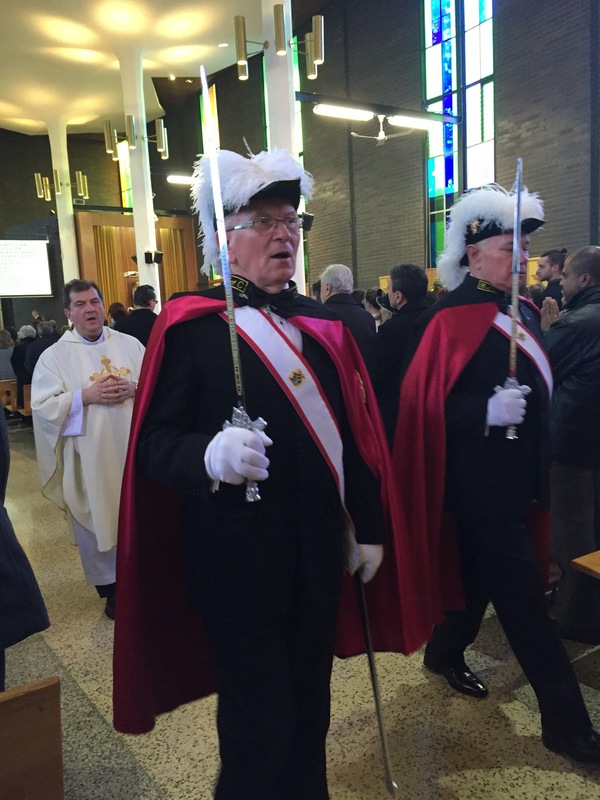 My dad was to dress up in his Knights of Columbus garb that adds a level of panache to the festivities. The parents wanted me to drive allowing them to relax. My dad made constant comments about which lane to go in and wheather or not I should pass. He can’t help himself from this behavior. The mass was well attended by all the polish families in the vicinity. It is part of the tradition during Christmas except that in Poland the churches are close and this mass is celebrated at midnight. Many of those in attendance used to be our customers back in the day when we had our shop. Many of their children have now grown up into adults that now have families of their own. I don’t recognize many of them but some of them I do. I’ve been away from this community for so long even before the time when my overseas adventures began. After the end of the mass we chatted with some of my parents’ friends and it seems that according to them I hold a view that is diametrically opposed to theirs with respect to what has been going on with the refugee crisis. There is a point to screening and being careful but there is also a point to being humane and accepting those in need. The powers that be have created this crisis and now we are left to deal with the consequences of it. There is a clash of cultures that this all instigates with some not willing to accommodate. When we got back to the house the little one was asleep so that we had to be quiet as we sat around. We did our breaking of the bread ceremony. This is always a heartfelt thing to do. When you look into one another’s eyes and wish them all the best things that you can think of. It is a really personal individual way of at once bonding and expressing love. There are both tears and laughter as well as hugs and kisses that get shared. Beneath the tough exterior there is a mushy beating heart that radiates love in all of us. We never had a chance to sing Happy Birthday to Erin but we got a chance to tonight. She was surprised with it and thankful for the gesture. Her birthday is really close to Christmas so it always gets lumped together with it. All those with this conundrum know how it feels. It’s tradition that we open up our presents after Christmas Eve dinner. There is none of this waiting for Santa to drop down the chimney business. As we are older and each in our own places the gifts are symbolic. We are no longer children but adults. As we get older we appreciate the gestures that people make more than the actual gifts themselves. Whatever we give to each other symbolizes the love we have for each other. My brother had the shocking “wow” moment this year. Deservedly so. He’s worked hard and really matured over the past couple of years. Having his son and the marriage itself has really done him a lot of good. We were up for a while talking and laughing enjoying the time we have together. In the morning it was a bit of a blur. There was the need for my brother to pack as they had his in-laws’ dinner to attend to and they had to catch the ferry across to the island. My sister was at work having picked up some shifts. I had some time to play with the little one as he was hoisted into my arms many times while his parents packed up all the belongings. He recognizes me more than his grandparents. That all has to do with the amount of time each of us had to spend with him. I wish that my parents finally have the time to enjoy time with him. It all lingers on them selling the house and retiring from their care taking duties. It’s finally time. Soon my bro et all left and soon thereafter my parents left for church as well. I was left to supervise the boys as they played and colored. I cleaned up as much as I could and sat for a while composing my experiences. I called my cousin in Poland with whom I spent a few Christmases in the past few years. They were enjoying the last few moments of Christmas together as a family. Afterwards I tried to upgrade my parents computer and came into a wall. Their operating system is too old to support the modern browsers. I’ll have to revisit that soon before I leave. My parents came back and eventually my sister did too. There was a continuum of phone calls and things happening. We never got a chance to sit down again and just talk. We tried but things come up and time passes quickly. My sis will watch the boys as my folks drive me to the station for my journey to the flat. My parents are sad to see me go and I feel that without them even mentioning it. Everyone in my family doesn’t want me to go. I can’t say it’s easy to leave and be apart from everyone but that’s why I made sure to be here and not out there for this holiday. I know what’s important and it’s not something that money can buy but something that one can only feel to appreciate surrounded by loved ones.